Most ophiolites are assigned to either the Tethyan or Cordilleran groups, which have different modes of emplacement yet are both SSZ in origin. The episodic emplacement of ophiolites throughout geological history suggests that the complexes formed and emplaced at times of super-continent break-up and dispersal when large ocean basins adjacent to super-continents subducted as rifting progressed. Tethyan ophiolites are named for the ancient Tethys ocean, and are found in the eastern Mediterranean areas ( Troodos in Cyprus, Semail in Oman). These are relatively complete classic ophiolite assemblages that were emplaced intact onto a passive continental margin. Cordilleran ophiolites are named for the Cordillera mountain belts of western North America. These ophiolites are not associated with a passive continental margin and sit on subduction zone accretionary complexes (subduction complexes). Cordilleran ophiolites include the Coast Range ophiolite of California, the Josephine ophiolite of the Klamath Mountains (California, Oregon), and ophiolites in the southern Andes of South America. Ophiolite assemblages in collisional mountain belts, such as the Alps, represent incipient ocean crust at thinned continental margins (formed during rifting and continental drift) that was emplaced into the collision zone. The stratigraphic sequences observed in some ophiolites suggest origins in lithosphere-forming, spreading centers at mid-oceanic ridges. Supra-subduction zone (SSZ) ophiolites are more closely related to island arcs than to ocean ridges, and are formed by rapid extension of fore-arc crust during subduction initiation followed by rebound of the continental crust carrying forearc lithosphere (ophiolite) atop it. The occurrence of ophiolite complexes within orogenic belts documents the former existence of ocean basins now consumed by subduction, so providing supporting evidence for plate tectonics. ● by an unrelated mineral. Overgrowth implies crystallographic continuity between the two participating minerals so far as permitted by their differing crystal structures. Where the overgrowth forms a more or less continuous rim around enclosed mineral, it is termed a mantle. 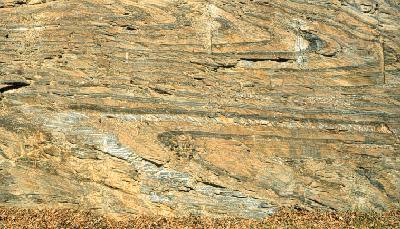 Folding may be so pronounced that strata are overturned beyond the vertical. In an overturned fold, the beds dip in the same direction on both sides of the axial plane because one of those limbs being rotated through an angle of at least 90º. An extreme example of an overturned fold occurs when the axial plane is horizontal – this is called a recumbent fold.